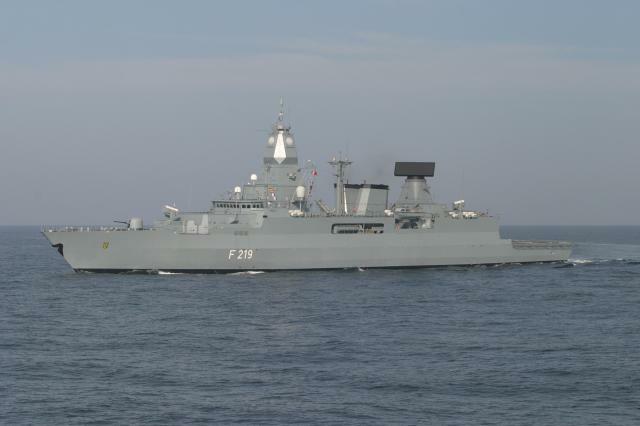 Three ships of the German Navy arrived in Simon’s Town this week on an official visit to the South African Navy, with whom they will hold joint exercises. 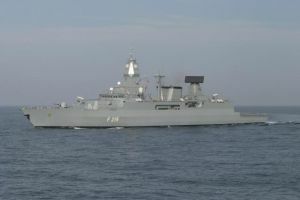 The three ships, the frigates Hamburg (F220) and Rheinland-Pfalz (F209) and the combat support ship Berlin (A1411) exchanged gun salutes with the SAN as they arrived at the Simon’s Town naval base and dockyard. Also in South Africa at this time to participate in the joint exercises off the coast are six Tornado aircraft of the German Air Force. 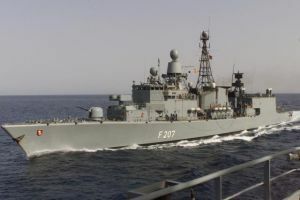 Between 3 and 6 March the task forces of the German and South African Navies will take a break from exercising with a courtesy visit to Cape Town. The ship’s power plant generates 38,000 kW (51,600 hp) with two diesel engines for cruising and a gas turbine for boost purposes with a top speed of about 29 knots. The ship carries two Lynx helicopters and is armed with an array of missiles in addition to a 76mm and several smaller guns plus two triple torpedo tubes. 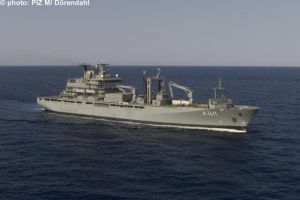 The class is designed to replace the Lutjens class of ship (type 103B). 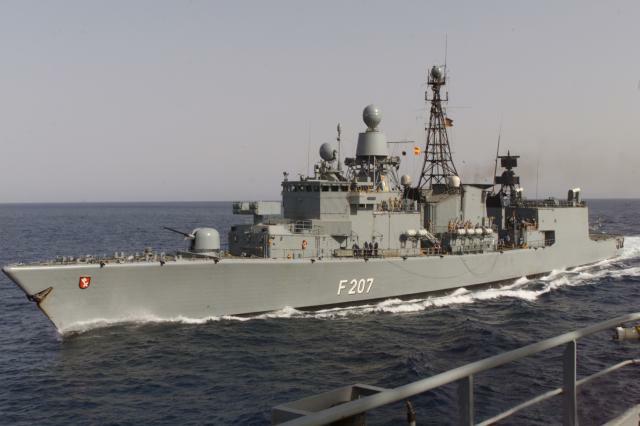 The other visiting frigate, Rheinland-Pfalz (F209) is one of eight Bremen class or type 122 frigates which were built between 1982 and 1990. This ship is 130m long with a beam of 14.5m and a draught of 6m and displaces 3,800 tons. She has a top speed of 30 knots and is powered by two cruise diesels and a boost turbine driving twin shafts. Her armament consists of a 76mm gun, two 20mm guns, four anti-submarine torpedo tubes, and an array of missiles in addition to two Lynx helicopters. 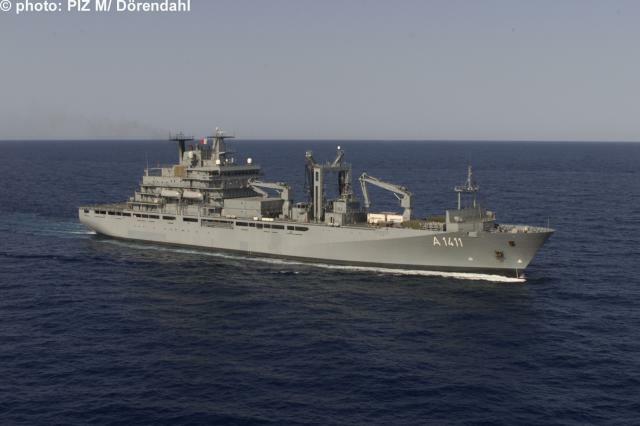 The visiting combat support ship, Berlin (A1411) is one of two similar vessels in the German Navy. The ship has full logistic and medical support for a fleet at sea and is designed to re-equip warships with ammunition and supplies. The Berlin displaces approximately 20,200 tons and is 174 m long with a beam of 24m and a draught of 7.4m. She is lightly armed mainly for air defence purposes and carries two Sea King shipboard helicopters. The ship cruises at 20 knots.